The popularity of Quinoa has grown exponentially among the health-conscious food consumers in the developed economies of the world. Quinoa (pronounced KEEN-wah) is rich in protein and is a better grain for those seeking to lose weight. 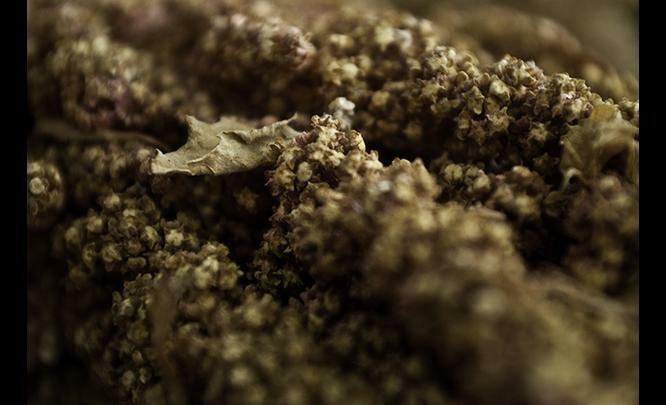 Quinoa has historically be rather limited but this diffusion is restructuring the geographic patterns of many places. 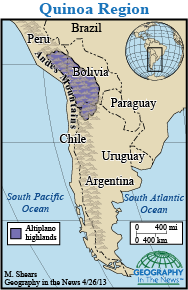 This map from a Geography in the News article shows that Quinoa has historically been grown almost exclusively in the highlands of the Andes Mountains. This was a localized food source for generations but this new global demand has increased the economic possibilities for Quinoa growers. At the same time, local consumers that have traditionally depended on cheap Quinoa to supplement their diet are now effectively priced out, as stated in this Al-Jazeera article. Questions to Ponder: What modern and traditional agricultural patterns can we see in the production of Quinoa? How have global and local forces reshaped the system?